Felt an earthquake ? Please let us know with the form below. NO WARNING... NO WATCH AND NO ADVISORY IS IN EFFECT FOR THESE AREAS. BASED ON THE DEPTH OF THE EARTHQUAKE WITHIN THE EARTH A TSUNAMI IS NOT EXPECTED ALONG THE CALIFORNIA/ OREGON/ WASHINGTON/ BRITISH COLUMBIA AND ALASKA COASTS. 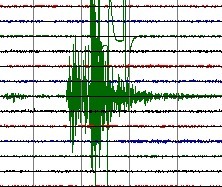 Todays earthquake is NOT an aftershock of yesterdays Riverside earthquake. California has been really active the last couple of weeks with a lot of shaking in many different areas. 25,000 people will have experienced a moderate MMI V shaking, 543,000 people a light shaking and 2,553,000 people a weak shaking. 15 million people may have felt a very weak shaking (not perceivable by most only by very sensitive sleepers). Update : We are printing all these I Have Felt It reports because they are giving the best indication of what has happened. Huntington Beach : Two, perhaps three minor jolts coming from West Southwest direction. No damage. Orange county: Strong Jerk lasted couple seconds. Huntington Beach, CA: It was very short but very strong! NO tsunami danger at this magnitude. This earthquake list covers important earthquakes in the world. I was awakened by a very loud sound and a quick jolt. I thought my water heater blew up. I never thought it to be an earthquake because I've never experienced an earthquake preceded by very loud sound, like an explosion. Irvine, CA. felt like it lasted 4-6 seconds it was very strong like someone was shaking my bed. and a very loud noise. Magnitude may be low but it is scary. Can't fall back to sleep because I'm scared that there may be another one. Please, God, no more! Wow, 3 major earthquakes M 6.0 or above in the span of about 1 hour and 30 minutes. Scary! What's going on? when ya make a place like broken hill into broken hole where is the wieght distribution going ?when ya take all the oil from underground and burn it where does the balance go when ya move so much earth and mineralls what happens to the atomic structure of the whole unit ?any answers ?